How Rafael Nadal finally took down Roger Federer. Rafael NadalRemember in the early 2000s when men’s tennis became close to unwatchable—booming serves, points that were over before you blinked, synthetic rackets blasting serves 130 miles an hour? With Rafael Nadal dethroning five-time Wimbledon champion Roger Federer on Sunday, that broad caricature of the men’s game no longer applies. In men’s tennis, defense now reigns supreme. Federer, of course, has not won 12 Grand Slam titles with his serve alone. He, too, has used his superior service return and all-around defensive skills to dominate more traditional power players like Andy Roddick. When he faces Nadal, however, Federer’s all-court genius is stymied. Federer relied on his monstrous first serve to help abate the enormous pressure in the fifth set. (You can watch the whole remarkable set here.) He served consecutive aces from deuce after the match’s third rain delay, at 2-2, then hit his way out of trouble again at 15-40 and 5-5. Every other player would have been demoralized after squandering these break opportunities. Not Nadal. He simply adjusted his underwear, broke Federer for the fourth time in the match, and served out the championship, winning 9-7 in the fifth. Nadal’s game hinges on defensive pressure—so long as he’s able to get the ball back in play, he always seems to have an advantage. Despite an improved first serve, which he hits consistently and at a higher percentage than Federer, it was Nadal’s stubbornness—refusing to ever concede a point—that gave him the edge in the fifth set. In a game where he didn’t end up breaking, at 5-5, 15-15, Nadal showed why he now looks impossible to beat. Federer hit a well-placed serve down the middle at 126 mph. The point should have been over, but Nadal somehow reached and returned the ball with reasonable depth. Federer then whipped a wicked approach shot into the corner, seemingly winning the point for a second time. Instead, he was met by a nasty, dipping forehand pass that he couldn’t return. Against any other player, either of Federer’s shots might’ve been good enough; against Nadal, he needed to win the point three times. Defense and offense are always intertwined in tennis, and it’s the instantaneous conversion of a losing position into a winning one that makes the sport so thrilling. Aces are exciting enough, but it’s the return of a seemingly unreturnable shot that gets fans truly ecstatic. Compare Sunday’s match to a recent one between Nadal and Croat Ivo Karlovic, a grass-court titan who the Spaniard took down at a Wimbledon warm-up tournament last month. Karlovic stands 6-foot-10, crushes his serve, and seems all but incapable of winning a point if he doesn’t produce an ace or a service winner. Nadal won the match in a pair of tiebreakers despite failing to break Karlovic’s serve once. This was a tennis dystopia, where the points are nasty, brutish, and short. Sunday’s match, by contrast, was the most utopian spectacle in tennis’ recent history. The inevitable changing of the guard talk shouldn’t overshadow that the 26-year-old Federer played brilliantly after a shaky two opening sets, most memorably hitting an ungodly backhand pass in the fourth-set tiebreaker that saved championship point. For another, Sunday’s match illustrated the striking similarities in the top players’ games. Nadal and Federer (and to a lesser extent, Novak Djokovic) wear their opponents down by forcing errors, weaving together finesse and power and spraying winners from places on the court that other players can’t reach. When everybody—even Nadal on occasion—can serve at 125 mph, such abilities are what distinguish those two from the more traditional power players like James Blake and the 155-mph-serving Roddick, both of whom fared poorly at the French and Wimbledon. This year’s results aren’t a sign that power no longer matters in the men’s game; one look at Nadal’s arms would dispel any such notion. It’s more that power in tennis today is largely manifested defensively; thanks to high-tech rackets and weight training, the best players can now hit shots on the run with incredible pace, depth, and spin, immediately placing them back on the offensive. Nadal, in particular, is turning the supposed disadvantage of bad court position into an outdated theory for lesser players. In men’s tennis, there’s no better way to get your opponent out of position than with a well-struck, well-placed serve. Nadal showed at Wimbledon that other players’ best serves aren’t good enough. He leads the men’s game in return games won in 2008, breaking his opponents’ serve 36 percent of the time, or roughly twice a set. After him come Nikolay Davydenko and Novak Djokovic, the Nos. 4 and 3 players in the world, respectively. Federer is tied for sixth in return games won, which may reflect his greater ease in holding his own serve—if you never get broken, you don’t need to break your opponent as often—but may also reflect unaccustomed troubles with his defensive game. In Sunday’s match, he had plenty of break opportunities in the first two sets but was unable to convert. In the fifth set, when he needed a break to win his sixth straight Wimbledon, Federer couldn’t put consistent pressure on Nadal’s serve. By winning the French Open and Wimbledon consecutively, Nadal has confirmed that in today’s game, unrelenting defense can win major titles. 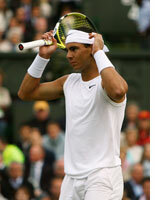 For Nadal to cement his position at the top, though, he’ll have to prove that his grinding style won’t destroy his body. The very brilliance that makes for such remarkable tennis may also—so the current fear goes—shorten the 22-year-old’s career. Roddick, with his booming serve, might conceivably outlast Nadal and become competitive once again. Federer, too, with his reliable serve, power forehand, and remarkable ability to stay healthy, may still be able to remain at a high level until he’s 30, or at least until he breaks Pete Sampras’ record of 14 Grand Slam titles. So long as Nadal is still standing, though, it’ll be a long slog for everyone else. Big servers take note: You’ll need to win every point three times. 1. “We have enjoined on man kindness to his parents; in pain did his mother bear him, and in pain did she give him birth” (46:15). 2. “Thy Lord hath decreed that ye worship none but Him, and that ye be kind to parents. Whether one or both of them attain old age in thy life, say not to them a word of contempt, nor repel them, but address them in terms of honor. And out of kindness, lower to them the wing of humility, and say: ‘My Lord! bestow on them Thy Mercy even as they cherished me in childhood’ “(17:23-24). 3. “We have enjoined on man and woman kindness to parents; but if they (either of them) strive (to force) thee to join with Me anything of which thou hast no knowledge, obey them not'” (29:8). 4. “We have enjoined on man and woman (to be good) to his/her parents; show gratitude to Me and to thy parents; to Me is (thy final) Goal. If they (parents) strive to make thee join in worship with Me things of which thou hast no knowledge, obey them not; yet bear them company in this life with justice (and consideration) and follow the way of those who turn to Me (in love)” (31:14-15). 1. The Prophet Muhammad said, may Allah’s peace and blessings be upon him: Your Heaven lies under the feet of your mother (Ahmad, Nasai). 2. A man came to the Prophet and said, ‘O Messenger of God! Who among the people is the most worthy of my good companionship? The Prophet said: Your mother. The man said, ‘Then who?’ The Prophet said: Then your mother. The man further asked, ‘Then who?’ The Prophet said: Then your mother. The man asked again, ‘Then who?’ The Prophet said: Then your father. (Bukhari, Muslim). 4. Abdullah ibn Amr related that the Messenger of Allah said: The major sins are to believe that Allah has partners, to disobey one’s parents, to commit murder, and to bear false witness (Bukhari, Muslim). Marriage in Islam is intended to cater to multiple purposes which include, above all, spiritual tranquility and peace, and cooperation and partnership in fulfilling the divine mandate. Islam – being a natural way of life – takes into account all of genuine human instincts such as physical, spiritual, intellectual, emotional, et cetera. Although fulfilling one’s physical needs in a decent manner is one of the main purposes of marriage, it is not the sole one. According to the clear statement of the Qur’an, tranquility and peace through a successful union is considered the primary objective of marriage: (Among His signs is that He created for you spouses of your own kind in order that you may repose to them in tranquility and He instilled in your hearts love and affection for one another; verily, in these are signs for those who reflect (on the nature of the reality).) (Ar-Rum 30: 21). Just as Islam aims at rearing a righteous individual, being the cornerstone in the social structure of the nation, it also seeks to establish a sound family, the prime and essential factor in building a good society. It is never disputed that marriage – that unites a man and a woman in solemn matrimony – is the foundation that gives rise to the family. There is no way a real or proper family could ever exist out of wedlock, the way that has been legislated by Allah, Exalted be He. Throughout the ages, humanity has come to learn of ideas and trends that oppose the idea of marriage. In Persia (now Iran), before the advent of Islam, there emerged Mani’s philosophy, which claimed that the world abounds in evil, that it should be exterminated and that prohibiting marriage is the fastest way to effect this goal. a) According to the divine laws and norms, nothing can ever perform its duty single-handedly. Allah meant everything to be in need of another of its kind, so that one would complement the other. In the field of electricity, positive and negative poles need to be in contact so as to induce an electric current, which in turn, yields light, heat, motion, etc. Likewise, electrons and protons should be in contact inside an atom. In plants, pollen grain carrying male gametes fertilize a flower’s stigma to produce more plants, fruits and seeds. Male and female animals have to be in contact in order to reproduce. The Glorious Qur’an highlights this universal law in the following two verses: (And all things We have created by pairs, that haply ye may reflect.) (Adh-Dhariyat 51: 49) (Glory be to Him Who created all the sexual pairs, of that which the earth groweth, and of themselves, and of that which they know not.) (Ya-Sin 36: 36) In response to this law, Allah, Exalted be He, has legislated a sublime tradition for a man and a woman to be united in such a way as befits the lofty status of human beings, namely through marriage. e) Marriage is the sole means of establishing a family, the nucleus of society. No respectable human society could ever exist, if not based on the family. Shaded by the close relations of motherhood, fatherhood as well as parent-child and siblings relations, warm feelings of love, altruism, mercy, care and cooperation are instilled in a Muslim. g) Marriage matures a man’s character through the responsibilities he has to shoulder, as a husband and a father, and similarly matures a woman’s character through the responsibilities she has to shoulder, as a wife and a mother. As we have just explained, many men refrain from marriage simply because they wish to live as grown-up children with no ties to bind them, no house to unite them or responsibilities they are to undertake. Such people are not fit to live; they are good for nothing. Marriage is thus a strong commitment and a shared responsibility between a man and a woman since their first day together. h) Having got married, a man can focus on perfecting his work, reassured that there is someone back home who disposes of his affairs, preserves his money and takes care of his children. He can thus do his job properly. This stands in sharp contrast to another whose mind is preoccupied and who is torn apart between his work and home, his job and the burden of securing his food and clothes back home. So he was taken aback when the phone rang last September and a voice told him thatKing Abdullah had chosen him as the first black man to lead prayers in Mecca. 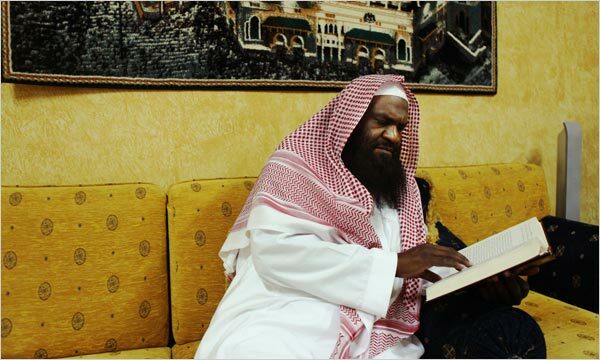 Days later Sheik Adil’s unmistakably African features and his deep baritone voice, echoing musically through the Grand Mosque, were broadcast by satellite TV to hundreds of millions of Muslims around the world.